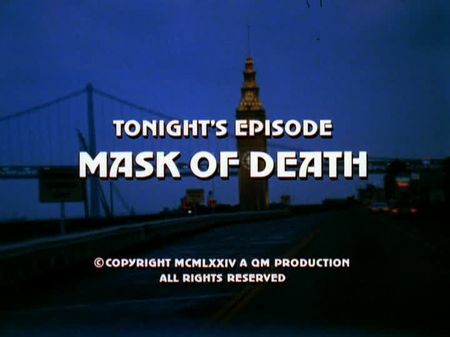 I have just added the screencaps for Mask of Death to the episodes' page. The murder of a foreign salesman who was stabbed to death in his hotel room keeps Mike and Steve busy. Autopsy discloses rather untypical thrustings, and the victim's nightly schedule leads them to the shows of Ken Scott, a famous female impersonator who is performing in 'The San Francisco Theater'. Scott's perfect and somehow terrifying performance as well as an earlier impersonating role call Mike's and Steve's attention, revealing that Scott may suffer from schizophrenic disorder. We as audience learn that Ken Scott's alternate female characters are gaining predominance of his mind, with the female part being on a homicidal mission resulting from childhood drawbacks. While this one is not among my favourite episodes, John Davidson's performance is extraordinary, and the topic of 'schizophrenia' is coming to the fore. Plus, a life-or-death struggle between Steve and Scott's female personality highlights this episode. The list of filming locations for this episode is rather short when compared to the majority of the series' episodes. Ken Scott performs at 'The San Francisco Theater' which used to be located at the corner of Post & Fillmore Streets (most of this area has been demolished and re-built over the decades), whereas the initial hotel indoor scenes were filmed at 'The Fairmont' on Nob Hill. We are also taken to the still unidentified mansion which was used in the predecessing episode, Target: Red, already. Steve flirts with attractive and wealthy owner Bobo Stanfield, making Mike somehow amused. The second murder victim is found inside the Sheraton Palace Hotel which is still sitting in its original location at Market and New Montgomery, whereas Ken Scott's old-fashioned brickstone mansion can be found in the Pacific Heights district.